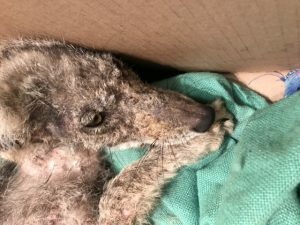 Coyote Admitted 10/24/2017 with the worst case of mange ever seen by Procyon Wildlife Staff. MANGE is a type of skin disease caused by parasitic mites. Since mites also infect plants, birds, and reptiles, the term “mange”, suggests a poor condition of the hairy coat due to infection. 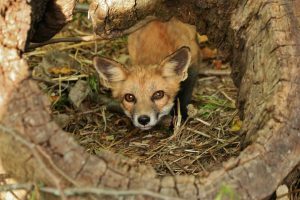 Mange can be seen in domestic animals (cats and dogs), in livestock such as sheep and in wild animals such as coyotes, fox and many others species. 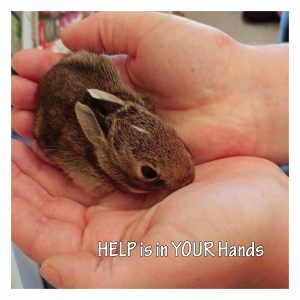 If the infected wild animal is brought to a wildlife rehab centre, the disease is fully treatable. Here is a before/after picture of a fox that was admitted to Procyon Wildlife. 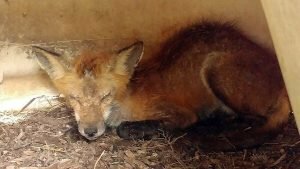 With the proper medication and TLC this fox is ready to be released today, without it, it would surely have passed away. Another happy ending! Last night we admitted a coyote (bottom pic) that came in with the worst case of Mange we have seen in a long time. Here’s hoping for another happy ending for this little girl.